The plot is pretty simple on Charlie’s Angels. Three very attractive policewomen are recruited into a private detective agency by a wealthy yet reclusive man named Charlie Townsend (voiced by John Forsythe). 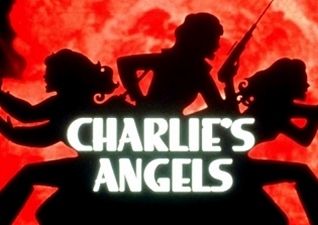 The three detectives called “Angels” are given their cases by Charlie’s assistant Bosley (David Doyle) or directly from Charlie via speakerphone. Charlie’s Angels are Sabrina Duncan (Kate Jackson), Kelly Garrett (Jaclyn Smith) and Jill Munroe (Farrah Fawcett). In progressive seasons there are quite a few cast changes among the Angels. Jaclyn Smith and David Boyle were the only cast members who stayed with the series for all 5 seasons. 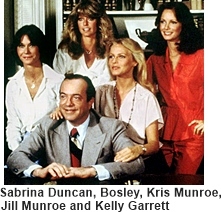 Replacement characters included: Jill Munroe (Farrah Fawcett) was replaced in the second season by Cheryl Ladd as Kris Munroe Jill’s sister. Sabrina Duncan (Kate Jackson) was replaced by in the fourth season by Shelley Hack as Tiffany Welles. Then in the next season Tanya Roberts replaces Hack as Julie Rogers. Most of the cast changes were made to accommodate the actors moving on to other projects but unfortunately the public couldn’t keep up and after several top 10 rated seasons the show lost its ratings in the fifth season and wasn’t renewed for a sixth. Two feature Charlie’s Angels films have been made. The first in 2000 and the second in 2003 starring Cameron Diaz, Drew Barrymore and Lucy Liu. Both films again featured the voice of John Forsythe as Charlie. Two reboots of the show were also attempted. The first in 1989 called Angels ’89 never got off the ground. The second attempt in 2011 had Drew Barrymore as a co-producer but due to horrible reviews and very low ratings only 4 episodes of the planned 13 were ever broadcast.